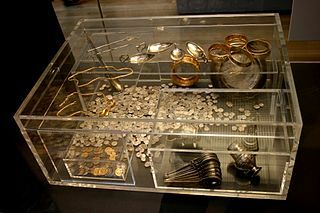 The Środa Treasure (Polish: skarb ze Środy Śląskiej, skarb średzki) is a hoard of silver and gold coins, plus gold jewellery and some precious stones. The hoard dates from the mid 14th century. Its largest component is silver coins, of which there are about 3,000 pieces. The hoard was found in years 1985–1988 during renovation works in Silesian town of Środa Śląska, Poland. Today it is mostly kept in the Regional Museum in Środa Śląska (although the owner of the hoard is the National Museum in Wrocław). Gold and silver coins were discovered during demolition works and digging for the foundation of the local telephone exchange building in the town of Środa on 8 June 1985. The authorities secured the original find (a vase filled with approximately 3,000 Prague groschen), however, no serious archaeological study was carried out at that time. Three years later, on 24 May 1988, during another demolition in the vicinity of the first discovery, another, even bigger find was reported (including silver and gold florin coins). Most of this new find disappeared before the site was secured by the authorities. In the following days, as enterprising individuals scoured the municipal landfill where rubble from other recently demolished buildings was deposited, reports of more discoveries started appearing; those include the first reports of jewelry. Archaeologists began to investigate the site, and the government announced a plan to buy back items that had been looted. Later, a criminal investigation was launched, targeting those who still refused to turn back the items they had taken. Although many items were recovered, it is agreed that there are still missing items. Looted items have been recovered intermittently. Over the following years, archaeologists and historians have speculated about the treasure's origins, while museums and wealthy individuals have competed for pieces of the treasure. It is now agreed that the treasure belonged to the King (later Emperor) Charles IV of the House of Luxembourg. Around 1348, needing funds to support his claim to the King of the Romans, Charles pawned various items to the Jewish banker Muscho (Moshe, Mojżesz) in Środa (the town of Środa was then part of the Duchy of Wroclaw (Breslau) which in 1335 had passed under reign of Bohemian kings). What is certain is that no one ever reclaimed the treasure, which was left hidden somewhere in the town for hundreds of years. Various recovered items have been cataloged, and those that were damaged by the mechanical digger that uncovered them have been restored. Some items were displayed as early as 1985. Since 1995–1997 most of them have been distributed throughout museums in Lower Silesia. The majority of the items are displayed in local museum of Środa Śląska, although in the past exhibits were held in museums including the Archeologicial Museum in Wrocław, National Museum in Wrocław (which technically supervises the museum in Środa), National Archeological Museum in Warsaw, as well as abroad, in the Museum of Arttistic Craft in Dresden, Germany and in Valladolid, Spain. The treasure is considered immensely valuable, described by some as "one of most valuable archeological finds in the 20th century". In 2006 experts noted that it is difficult to put a value on it, since there are few items of similar type being auctioned anywhere in the world. One estimate from 2001 put the lowest value of the treasure at 50 million dollars; a book published in 2005 put it at 100 million dollars. Regional Museum in Środa Śląska, where the Środa treasure is located. The Erfurt Treasure is a hoard of coins, goldsmiths' work and jewelry that is assumed to have belonged to Jews who hid them in 1349 at the time of the Black Death pogroms. The pieces were found in 1998 in the wall of a house in a medieval Jewish neighborhood in Erfurt, Germany. The Słuszków Hoard is a treasure hoard found in the village of Słuszków located in the historical area known as Kalisz Land presently situated in the Greater Poland Voivodeship. The treasure was buried around the year 1100 and uncovered in 1935. Since 1958 it has been a part of the collection of Kalisz Land Regional Museum. The hoard includes the largest collection of medieval silver coins in Poland as well as the largest collection in the world of the so-called "cross denarii" or "cross pennies". Labanoras [ɫaba'noːras] is a small town within the Labanoras Regional Park in Lithuania. It is situated on Labanoras Lake and is surrounded by the Labanoras Regional Park, the largest regional park in Lithuania. As a center of the Labanoras Park, the town attracts tourists. A hotel and restaurant were opened in a former school building in 2003. According to the Lithuanian census of 2011, the town had 59 residents. The Boscoreale Treasure is the name for a large collection of exquisite silver and gold Roman objects discovered in the ruins of an ancient villa at Boscoreale, near Pompeii, southern Italy. 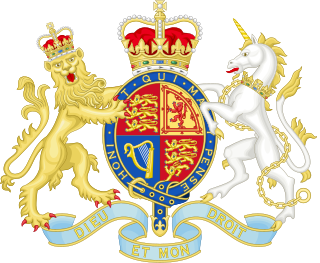 Consisting of over a hundred pieces of silverware, as well as gold coins and jewellery, it is now mostly kept at the Louvre Museum in Paris, although parts of the treasure can also be found at the British Museum. Litva Hoard is a medieval treasure found in Litva (Літва) village in Maladzyechna Raion, western Belarus. It was discovered in the early 1990s and contained a large number of Prague groschens and a large gilded silver belt. It is the largest Prague groschen hoard found in the territory of the former Grand Duchy of Lithuania. They were minted in Kutná Hora during the reigns of John of Bohemia, Charles IV, and Wenceslaus IV (1310–1419). The ornate belt is an example of Islamic art and must have been a gift from the Crimean Khanate. It became known as the Belt of Vytautas because of speculations that it might have belonged to Grand Duke Vytautas though there is no direct evidence to support the claim.